Counterfeit wine lawsuit: Is a $30,000 bottle of wine delicious? 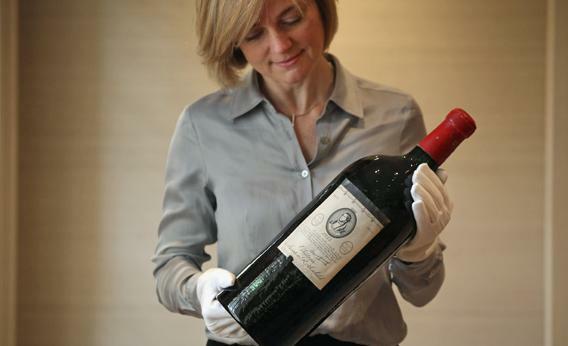 How Good Is a $30,000 Bottle of Wine? In other cases, buyers clearly intend to impress their wealthy friends with the experience of quaffing a delicious rare vintage. Consider the (probably fake) 1921 Château Pétrus that is now the subject of William Koch’s lawsuit. As Steinberger described in his investigation, a double magnum of the stuff sold for just $6,800 in 1991. Four years later, renowned critic Robert Parker awarded the wine a perfect score, and the price jumped. In 2000, a magnum sold for $10,000, and Koch paid nearly triple that amount in 2005. A rapidly growing base of wine-loving billionaires was responsible for some of that increase, but much of it can be attributed to Parker’s endorsement of the vintage’s quality. A portion of a super-expensive wine’s price can also be attributed to the egos of billionaires. The wealthy are often willing to pony up laughable sums not for the hope of a good return, or even for a night of fine drink, but for the priceless rush that only the smash of an auction gavel brings. That leads to another point that wine critics bring up when discussing this category of wine—many wine connoisseurs detest the recent spike in high-end wine prices. Astronomical price tags shut most true wine lovers out of the market. Mindset greatly affects your enjoyment of an expensive bottle of wine. For many buyers—even the super-wealthy—spending tens of thousands of dollars on a single bottle of wine can generate anxiety or a touch of buyer’s remorse. Worries about the wine’s ability to live up to expectations, whether they’ve paired it with the right food or uncorked it at the proper moment take all the joy out of the occasion. Growing concerns about counterfeiting also affect a high-end wine tasting, in the same way that the specter of performance-enhancing drugs has taken some of the wonder out of being a sports fan. Even if an expensive wine is enjoyable, nagging doubts invariably taint the experience. Explainer thanks Eric Asimov of the New York Times, Jamie Goode of Wine Anorak, wine critic Jancis Robinson, and Mike Steinberger of Wine Diarist.